Top models from Japan, including Yamada Yu (27), Sasaki Nozomi (24) and Hasegawa Jun (25) took part in the first 'SUPER GIRLS FESTA' fashion event in Taiwan on 15th April. 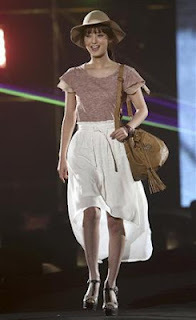 Sponsored by Yoshimoto Kogyo, 8000 spectators in the audience cheered on the 50 models as they walked down the runway. Jolin Tsai, Lollipop F and Sekai no Iwari also performed at the event.